Staples' James Frusciante pushes for yards as Staples' Bobby Sampson tackles as Staples High School hosts West Haven in a Class LL football quarterfinals game in Westport, Conn., Nov. 27, 1012. It took just eight seconds on Tuesday for West Haven to learn first-hand what the rest of the FCIAC already begrudgingly knew. The top seed in the Class LL state playoffs is as mighty as can be. For over two months, Staples crushed everything in its path and took home another FCIAC championship--its second straight and seventh all-time. Along the way, it lit up the scoreboard at an obscene rate, piling up the kind of numbers that few teams in the state were able to match. Life in the state's deepest playoff bracket is supposed to be a tad more turbulent with three other unbeatens and two-time defending champion Xavier in the mix. But on Tuesday, the Wreckers showed they are still comfortably settled in, right at home. After rolling up nearly 500 yards of offense per game in its march through the FCIAC, Staples was greeted by an eight-win team from a true power conference, the SCC, and made a statement with a 42-20 win. In fact, it might have been the loudest statement the unbeaten Wreckers have made all season. They struck early, they struck often, and by the time the night was through, they had left no doubt. The Wreckers turned a state quarterfinal playoff game into a clinic. Wide receiver James Frusciante's 60-yard run-and-catch on Staples' first play from scrimmage made it 7-0 just eight seconds in. Running back Nick Kelly's 92-yard run a little over six minutes later--on the Wreckers' second offensive play--made it 14-0. Three minutes later, the Wreckers scored again, and then again, and again after that. Four touchdowns in six plays. "They executed very well. Every kid they gave the ball to is a very talented kid," West Haven head coach Ed McCarthy said. "They're riding one back who's a real good player, the quarterback pulls (the ball), he's a real good player, and the guy he pitches it to is a real good player. That makes it hard." Hard might be an understatement. 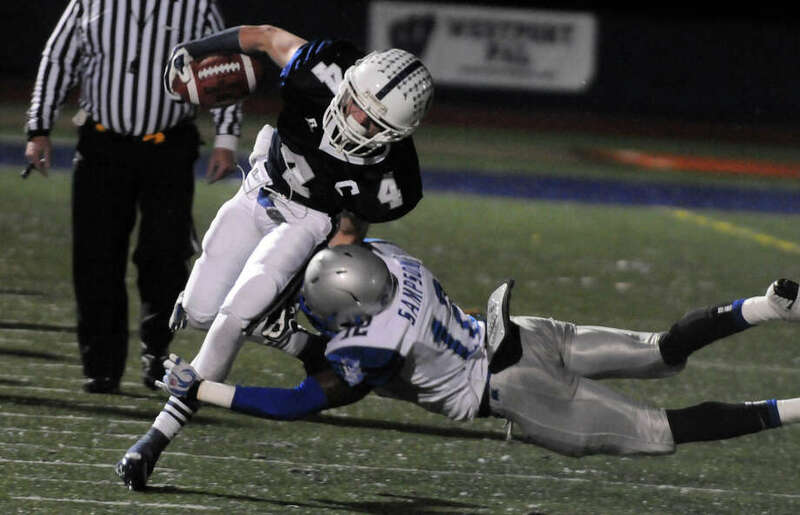 West Haven stormed into the postseason with just two losses and a punishing running game to boot, but found itself without an answer for Staples. The Wreckers' speed on offense was too much, their power was too much. "It's very difficult to emulate their speed with scout team," McCarthy said. West Haven had the third best record in the SCC this year behind powers Daniel Hand and Xavier, but trailed 35-0 at halftime. Any aspirations that the Blue Devils had of throwing Staples off-kilter for a night were long gone. "We came out and we played hard against a very good team," Staples head coach Marce Petroccio said. "We know that this is an FCIAC-SCC type of thing and we just wanted to go out and play hard, and try to win the game." The Wreckers have yet to trail this season and have won all 10 of their games by at least 18 points. They made another statement--a pretty loud one.